Today’s F.A.Q. : How old were you when you started writing? 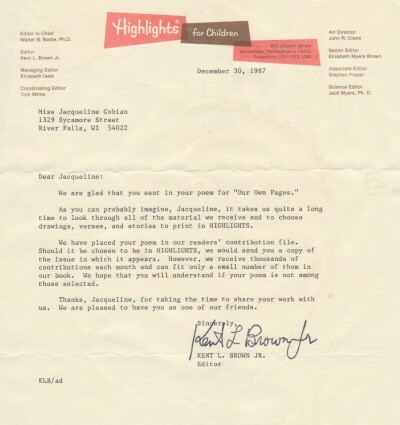 This is my very first rejection letter. It came from Highlights Magazine, and I just rediscovered it last fall, glued into my oldest scrapbook amid a lot of My Little Pony and Care Bears birthday cards. 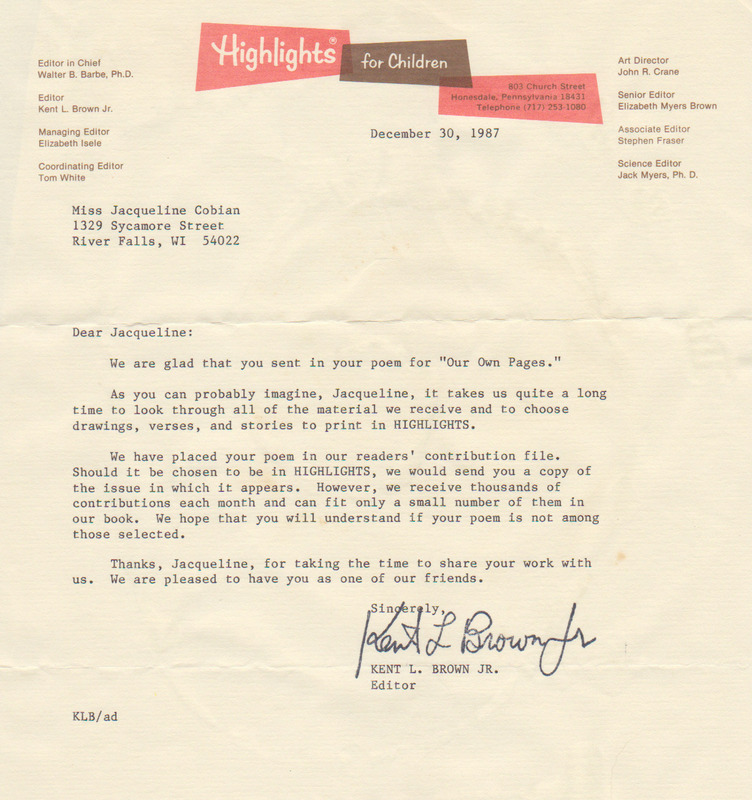 Of course, Highlights handles submissions from kids very kindly, so it wasn’t so much a rejection as a “Don’t call us; we’ll call you” sort of letter, but the outcome was the same. I’d sent them some little four-line rhyming poem–I think there were cows in it–and I was trying to write something that the magazine would like, not that I liked. You can see the date, typewritten at the top: December 30, 1987. The day after my eighth birthday. The poem I sent to Highlights is the first poem that I can recall putting on paper outside of school, on my own, just because I wanted to. I started writing my first “book” not too long afterward: It was a lavish mess about a rebellious princess who ran away from her kingdom and ended up in a valley full of unicorns (as one does, if one is a rebellious princess). I didn’t show that story to anyone. And I didn’t show anyone my next story (which was probably also about unicorns), or my next poem, or the story after that, or the poem after that. And I didn’t submit my writing to any kind of publication for another eight years. By then I had written dozens of poems and stories. And I had gotten a little bit better at it. I don’t think I submitted to HIGHLIGHTS, though something about that letter seems SO familiar. I did submit more than once to CRICKET magazine. I think they were kind, though I was crushed all the same. I love the typewritten note!